Phantom Regiment's rehearsal in Arlington, Va. The Washington Post reported two days earlier that a temperature of 99 degrees in Washington, D.C. broke a 116-year-old record, but those extreme conditions didn't deter a sellout crowd from showing up in Arlington, Va., Saturday, June 26 for the DCI Salutes America Premier Event. Fans were ultimately delighted by the performances of six World Class corps throughout the evening, but the competitive drum corps action was only icing on a multi-tiered cake called the Marching Music Academy. 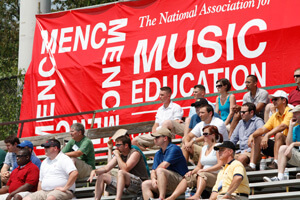 Hosted as part of MENC: The National Association for Music Education's Music Education Week in Washington, D.C., the first-ever Marching Music Academy was sponsored by Drum Corps International. 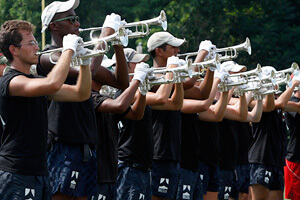 Over two days, kicking off on Friday, June 25, the Academy included a series of presentations and workshop sessions covering a variety of marching music topics. From arranging, composing and visual design, to the health and wellness of performers, nearly 50 attendees representing a diverse cross section of high school and college band directors and other music educators, were engaged in sessions by notable marching music personalities including DCI Hall of Fame member Michael Cesario and designers and staff of the Phantom Regiment. "It's been really great," said Carl Collins, director of athletic bands at the University of Kentucky who attended both days of the Marching Music Academy, "not only from the perspective of getting hands on [instruction] and visiting with these fantastic clinicians, but also being able to visit with some of the other conductors and directors and the high school teachers and even elementary school teachers who were here." As part of the Academy, MENC introduced those educators to its set of marching music standards developed in part by Drum Corps International. Those standards will support teachers throughout the country in aligning their entire music programs with MENC's National Standards for Music Education. Phantom Regiment rehearses Saturday afternoon. "I'd have to say for the most part, that this Academy in terms of its relationships to DCI, is breaking new ground," said DCI Judge Administrator John Phillips who served as a presenter and key coordinator between DCI and MENC for the event. "This was a group of interested educators who deal with marching in their own school system but who might not quite have a deep understanding of how intense our activity is. The presenters were dynamic and engaging, and I think the participants got a lot out of it." Before the competitive portion of the DCI Salutes America event Saturday evening, Marching Music Academy participants had the opportunity to watch a Phantom Regiment rehearsal and interact with the staff and corps members to better understand what they go through while training. Between that Phantom Regiment rehearsal and the corps performances later in the day, the drum corps left a lasting impression on the music educators in attendance who included members of the National Executive Board of MENC. "Part of my job (College of Wooster, Wooster, Ohio) is that I do direct a marching band myself, and I see the evidence of all the hard work and the discipline, the musicianship, and all the things that we train our students and our musicians to do every day," said 2010-2012 MENC President-Elect Nancy Ditmer in remarks to the audience. She says that the continued development of the partnership between DCI, MENC and other music educators is extremely important, "so that we can continue to help these students succeed not only in our music programs and in our schools, but also as they go on through their lives and become wonderful young people, middle aged people and eventually older people," who Ditmer joked would eventually have the same silver colored hair of her own. Saturday evening at the competitive portion of the DCI Salutes America event, the Bluecoats repeated their first place finish in Louisville, Ky. over Phantom Regiment with a score of 78.100. Regiment (2nd, 77.100) worked to tighten the gap between the two corps which stood at more than a point and a half last Tuesday. Though the Bluecoats have strung together impressive victories at two DCI Premier Events in less than a week, Executive Director David Glasgow says that the corps is not looking to rest on its laurels. "We've certainly had a good start, but we know there's a ton of work to do to this show," he said. "We're nowhere near finished. We still have a lot to [make better], so we're pleased where we're at right now, but we know we have a lot of work to do." The Boston Crusaders may have had some extra jitters to work through in Arlington as they got set for their very first competitive performance of the season. But even for seasoned veterans of the world's most elite marching music ensembles, those feelings can often be expected. As third-year trumpet player Scott Wynocker said, "every single time I step foot on the field it's just the most amazing feeling ever. There are goose bumps, butterflies, everything." Thanks to four weeks worth of rehearsals that the Crusaders put in during spring training, the corps' score of 75.000 was solid enough for a third place finish over the Crossmen who were in fourth with a 67.900. Fifth place went to Spirit (67.100) with its highest score to date. Drum Major Jenetta McGee says Spirit's success in 2010 will be forged by a cohesive group of corps members ready to work together. "The vibe [within the corps] this year is really different," she said. "It's something you can feel when you wake up in the morning and when you step onto the field. [The corps members] want it this year. The vibe is very strong, and our connection as a family is very strong too." 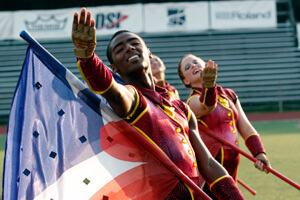 Jersey Surf members, like the Boston Crusaders, also kicked off their 2010 season with tonight's performance. The corps patriotic production, "Living the Dream," was a fitting opener for this event in the Nation's capitol. A score of 62.100 will stand as a benchmark as the corps continues to perfect its performances throughout the remainder of the summer season. As June soon turns to July, it will be a busy month ahead. 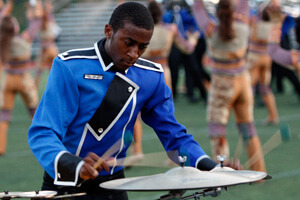 There is a Drum Corps International Tour event scheduled for every day in July with DCI Premier Events coming up in Kalamazoo, Mich. and Denver, Colo. on Saturday, July 10, followed by a brand new event in Minneapolis, Minn. on Saturday, July 17. With assistance from Craig Olear.